What you need to know before you make the investment for success. 1. Measure your space...then measure again. This may sound obvious, but making sure that your new equipment will fit in the designated space when it arrives is essential. You don't want to have to reconfigure your kitchen or worse, have to return the equipment just because you measured incorrectly. This is a good occasion to borrow from the old carpenter's adage, "Measure twice; cut once." 2. Make sure that you need it. Although it can be tempting to add that new piece of equipment and to buy all of the latest equipment for your new venture, it's wise to take a close look at your existing equipment (or the other equipment that you'll be ordering) to make sure that there isn't any duplication. Many pieces of kitchen equipment can perform multiple functions, such as a combination convection oven and steamer or a prep station with additional shelving for storage. If you're a new restaurant business, have you consulted your new menu? Is the equipment you plan on ordering necessary for your food plans or is it just a fun thing to have? 3. Consider the usage cost. Just like consumer appliances, it's important to consider how much this piece of equipment will cost your business to run (in terms of electricity and natural gas.) One good way to get this information is to look for the EnergyStar sticker or emblem on the equipment. The blue stickers indicate an energy efficient model. 4. Check your local building and health codes. Health, fire and building codes vary depending on the area your restaurant is located. Such codes can affect how close certain pieces of equipment can be to one another, where they are located in relation to exits and public areas and how large the units need to be for the staff you intend to hire, just to name a few examples. It is best to review these codes carefully before ordering, or better yet, have a building inspector review your plans to make sure that they meet all of the local codes. It will be money well spent. Violating these codes can cost you hefty fines, cause you to have to rework your kitchen design and even, in extreme cases, cause your restaurant to close. Remember, too, that as tempting as it may be, installing a residential grade piece of equipment in a commercial kitchen is against virtually all health codes. Buying NSF approved equipment may also be something to consider. You can learn more about what NSF is and why it's important right here. 5. Do you need a warranty? Warranties are offered by the manufacturer on most large pieces of kitchen equipment at an additional charge, and cover repairs (or replacement) to the unit if the equipment breaks down for a covered reason. While warranties can be a big money-saver down the road, it's important to read all of the fine print before you purchase such an agreement. Not all warranties are alike, so it pays to compare one manufacturer's warranty to another's for a similar piece of equipment. 6. Make sure you have the necessary power and outlets for your equipment. Many pieces of large kitchen equipment require dedicated outlets. Even with smaller pieces, you want to make sure they align with your power sources, so you don't have to run an extension cord across your kitchen work area (!) Plan the power sources in your layout to avoid any trouble once the equipment is delivered. 7. Should you purchase new or used equipment? While used equipment, from an auction house or a restaurant that has closed, can save you money, you'll want to look carefully at the age and condition of the used equipment you are considering purchasing. 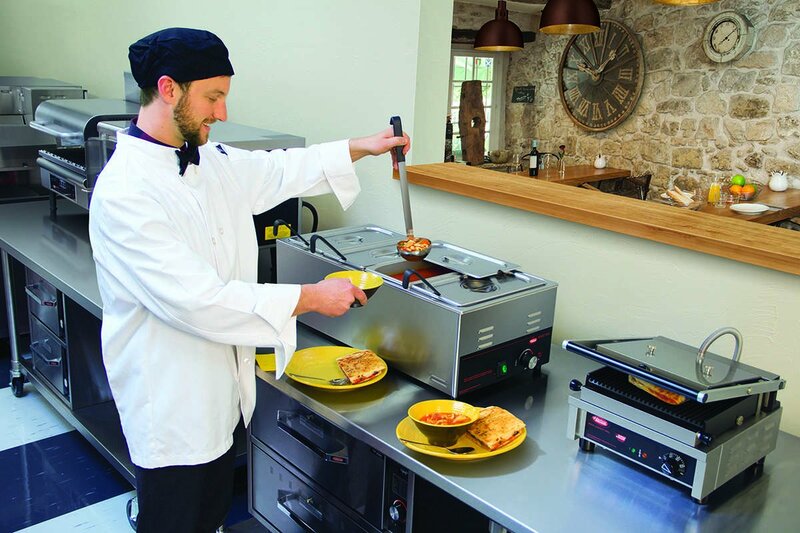 Non-electric and non-mechanical pieces, such as a prep station, may be a good buy, but older electrical kitchen equipment may be more expensive to operate and more likely to break down without a warranty. One expensive repair on something essential like an ice maker could negate all of your savings in buying used equipment. Also, new equipment is likely to have a longer lifespan than used equipment. 8. Are there green rebates in your area? Many utility companies around the United States offer rebates on utility bills to restaurants and other companies that invest in energy-saving equipment. The government's EnergyStar program also periodically offers "green" rebates. 9. Simpler is usually better. While all of the latest bells and whistles and electronic control panels are intriguing, a piece of equipment with fewer electronic and mechanical parts is usually a better option. All of those electronic components add little to the functionality of the equipment and can add up to an expensive repair bill when/if they stop working correctly. 10. Look for water-saving features. Most people outside of the restaurant industry are surprised to learn that water is the largest utility bill in most restaurants. Water is used for ice, for dishwashing, cleaning and more. If you can find a piece of equipment, such as an ice maker, that offers a water saving feature, you could save hundreds of dollars in a year on your water bills. Lastly, it's a good idea to take a few minutes to consider the style and look of your new restaurant equipment. If you are replacing an existing piece of equipment, you likely want it to resemble the piece you had. For new restaurants, you'll want the look of your kitchen to reflect your brand, your image, and your company's personality. 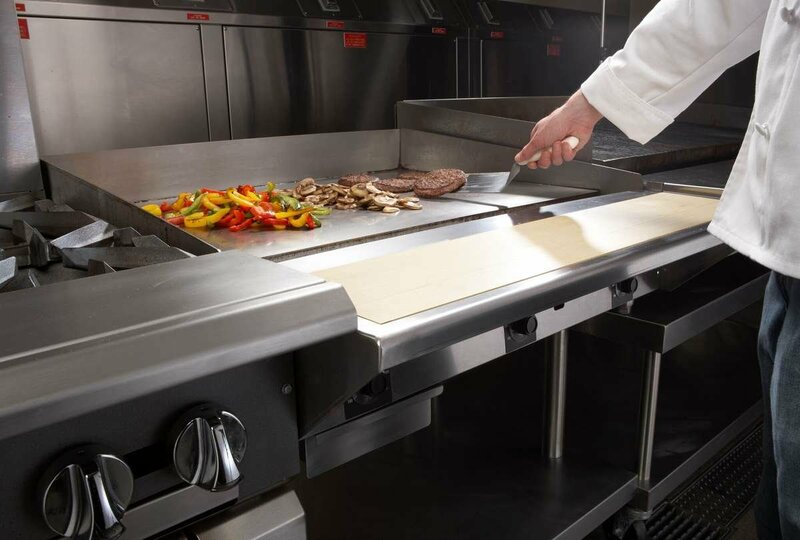 Dean Supply Company has been outfitting commercial kitchens like yours for more than 65 years. We invite you to visit our Cleveland, Ohio showroom and shop online at ShopAtDean.com. 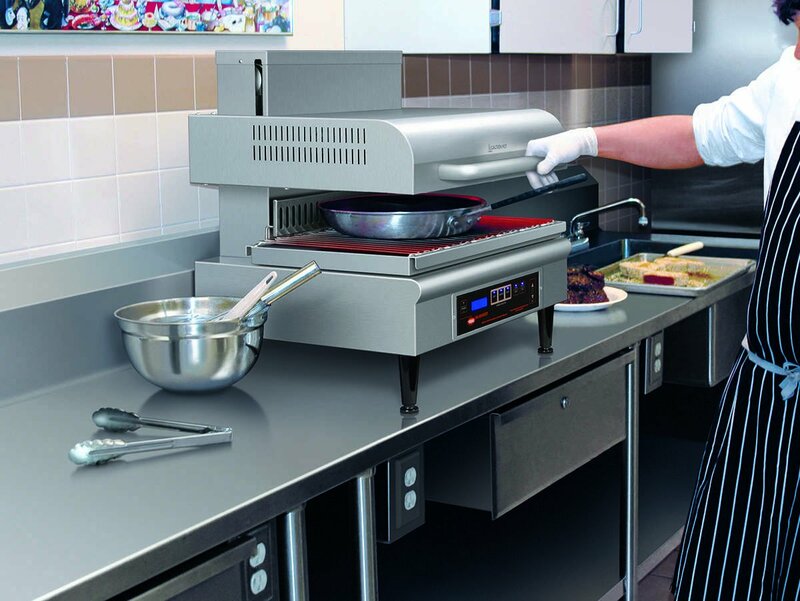 We offer FREE shipping on many commercial kitchen equipment items and in most cases, you'll have your order within seven days of purchase. For more information on ordering all of the equipment and other items you need for your restaurant, catering business or coffee shop to succeed, contact us today at help.desk@shopatdean.com or 844-343-3382.